In this video, I get more into my ideas about teaching inspired by recalling my times with John. And also more of what I remember of John's thoughts on warming-up, embouchure and professional etiquette. I am also realizing more and more that I did not have tons of lessons with John. But it proves to me once again, that if you make the most out of what you are given, it will keep yielding fruit for years to come. As I think about it now, it highlights a lot of what has been noticed over the past few years concerning students growing dependency on so many external things. Be it tuners, metronomes, video aids, recording every lesson they take, easy access to information through the internet and taking lessons from so many people so often, to name a few. I am not sure all this is being utilized in a way that is aways helpful to the person's development. Sometimes less can be more because you have to really dig into the small amount to extract the gems and wisdom from your persistent effort and discovery. Plus, not so much is taken for granted and your value for what you are given is greater. As I mention in this video, my main purpose for doing this is to just let my times and experiences with John just flow from me in any order in which they want to appear. It is great for me to do this because it is helping me access things about John's teaching with me and it is bringing up some things about my own teaching as seen through this experience of thinking about John. I seem to be having a difficult time remembering certain pieces and the names of what trombones I was playing on during these video recordings! Weird actually. Carol is here to correct me though! Even when it comes down to my not remembering the Strauss opera Salome! She is such a wonderful partner with me in all things because of her perceptions and depth of sentiment in her thinking and feeling life. Even though Carol was with John and his wife Myra only twice in person, she vividly recalls how impressed she was with him as a person and having such a brilliant and creative mind. John was one of my greatest influences as a musician-trombonist and with a mind that was very clear that not everyone is the same. He worried about people thinking they have to follow the crowd and play in a way that was really not natural for them. I totally agreed with him and always believed that. I had many great influences in my life and in this video I recall John telling me about his influences, including composer-conductor Gunther Schuller and trombonist Neal Di Biase, former principal trombonist of the NBC Symphony under Toscanni . Wow... can't believe it is the end of the of the summer and school starts tomorrow! I sure hope that the videos were useful this summer. I thank those of you who sent me emails expressing how much you got from these videos and writings. It will be important to take your time with these videos and writings if they do spark an interest in you. Find your own way with them. Some people like to listen to one a week. That could be very useful actually. If you spend that much time with one and listen to it everyday for a week, plus put into practice what is being said, there is NO doubt in my mind that you will get a result. Quick results are often a gift or 'preview of coming attractions' so don't get get disappointed if it does not stick right away. There is always the maintenance work to do. You can't have growth without keeping up the work on a consistent and regular basis. Approach and attitude are so vital to the quality of your accomplishments and development. I recently am telling everyone I teach or coach, that the reason people get in a rut, is that they forget about infinity. That's right! If you can remember that when there is a will there is a way and another way, you will always have some productive movement. When things stand still, that is really not being in a rut. In organic development, there are times when things need to accumulate to a specific point and then there is movement or a growth spurt. Remember: there is always an accumulation, shedding or building taking place at a subtle level that can not always be felt. There is vertical growth and horizontal growth. There is physical growth and mental and emotional growth. There are even deeper levels of growth. In the next week or two, more videos will be coming out. One of them will be on high range, another will be me showing different kinds of exercises I do and another will be with Dr. Carol Viera, my wife Carol. I wish you all the best for the school year and hope to see some of you at my THINK CONCERT on October 2nd at 8PM in Williams Hall at New England Conservatory. It will be quite an unusual concert and will end with a world premiere called Sonic Slideshow of St. John's Newfoundland for trombone choir. It will be performed by a Frequency Band Inspired trombone choir. I wrote this piece after Carol and I visited St. John's Newfoundland this summer. I will post more about this concert later. On With the Battle and of Life! FBSMC4: How Are You Doing So Far? So far there has been 5 sessions that include 21 videos. That is a lot of information, knowledge and practical exercises with tons to think about and apply for those who are interested. There will be more videos coming in the second week of August, but I wanted to 'check' in with you all who are following this. Because of the 'live' nature of the presentation, you might have to really take your time and let yourself get into the spirit of what is trying to be communicated. Also, in the midst of it all, write down some of the practical exercises and try them out. But try them with the attitude and sentiment of a musical approach. What really does the word musical mean? Musical does not stand for, in my view, over emotional indulgence or a theater of self emoting so others can watch. Musical is in the spirited connection to the essence of what one is doing. The musical connection goes through and through our entire being. It is the DANCE of sound expressing itself through our mind-attitude, emotion-feelings, body and instinct. It is the artist who is searching for the right color or shading, it is the architect finding the shape and contour of a building, it is in the cook pouring their love into the food and wanting to cause joy in others, it is in the healing touch of a sincere nurse when he or she practices the Art of care and on and on. Please find examples yourself. It will put you on the frequency of music as a living thing. Find a simple exercise that is given in any of these videos or writings that interests you and/or you feel the need to work on. Then find something in life, a movie, a dance, a picture, a gesture, something in nature, to put in your attitude and feeling while working on it. It is a simple and natural thing. Be the artist of your own music making. Working on the basics ideally should be joyful. If one is injured and has to 'start over again' it is back to the basics. Nurture these basics with love and care and they will be your friends and companions throughout your whole playing career. That is the key to a musical approach to the basics. May I suggest that before you sit down to this 50 minutes master class in these 5 videos, that you take a look at the previous blog post which was put up a few hours before. It will be a good introduction to this session and will give help advice at how to get the most out of this master class. Enjoy and discover! As is probably very obvious so far in these videos, the nature of my delivery is in the 'spirit' of the subject matter. If you are interested and take the time, you will be able to find the various steps of development for each of the topics. There are tons of concepts and exercises given in each video. But just as important, is the opening up of the subject matter so one can go on a journey of discovery with it. To go where maybe you have never been with the subject or to address issues you might of thought about and to bring them out into the open. Each topic is a living organism and is connected to the whole life of the art. This is why I approach each one in the way that I do. To encourage your life engagement with the topic so it is real and personal for you. One size does not fit all. Later today, 5 videos will be posted about that favorite brass subject, sound production. This will be Session 5 of this summer's Frequency Bone Summer Music Connection 4, "A Musical Approach to the Basics. "In these videos I try to encourage everyone to take a look at sound production in a musical way and a natural way. Sound or tone is a body or vehicle. It is not the music itself but can be likened to clothes. Just because someone has an attractive body or wears stylish high fashion clothes, doesn't always let you know what kind of person they are or what they stand for in the depth of themselves. Also, would one set of really nice clothes be appropriate for all activities? Of course not and neither would one sound. This I understand is beyond a very young players concern, (there are exceptions! ), but I am trying to encourage people to not totally fall in love with one sound for all things. As an instrumentalist, I have seen this clinging to one ultimate sound way too often and also taught to students who actually are not 'made' to have such a sound. NOT EVERYONE IS MADE TO HAVE THE SAME SOUND OR EVEN CAN HAVE A PARTICULAR SOUND EVEN IF THEY WANT IT. *Where are we directing our sound to come from? *Can we tell the condition of our embouchure from the qualities in our sound? *'Edge' in our sound. Is it really a matter of good or bad? *Orchestral excerpts, how far can we stretch our sound? *Do we have our own sound? *Does the trombone have its own sound? Something to keep in mind is these videos are recorded live. There are no edits at all. This series of 5 videos were made one after the other. It is really like a 50 minute master class that starts to open up the subject of a musical approach to sound production. It really is not possible to talk about endurance without going into building strength in general. Let's look at strength. Strength is having the power and energy to do what you want to do whether it is to move a table, lift something, or walk across the room. When people are really sick, they might not even have the strength to speak. So strength and energy are very connected. But the strength it takes to lift five hundred pounds over your head is different to the strength it takes to give an excellent moving speech. Both take energy, strength and focus. Now think about our music. Think of the control it takes to play soft and high. Now how about loud and low? What about very fast playing? The list goes on and on doesn't it? Is having control the same as having strength? Is focus a kind of strength? Where does energy come into play concerning focus, strength and control? The thought process above might help some people to understand how things work. It might help with teaching others. But you don't have to 'understand ' all of that mentally to have strength, energy, focus or control. But, the more you get into it, you may start to naturally feel and silently know these subtle relationships. 1.Repetition is key to building anything. 2.Regularity is vital to making 'good' your repetition. Know the signals of your body and mind when they are saying STOP. Extreme loud playing in the high and low registers do not have to be practiced daily. Find out in your playing schedule what can be done every 48 hours or 72 hours. Before practicing clear your mind by organizing your thoughts. Know what you want to practice and go for it with zeal. 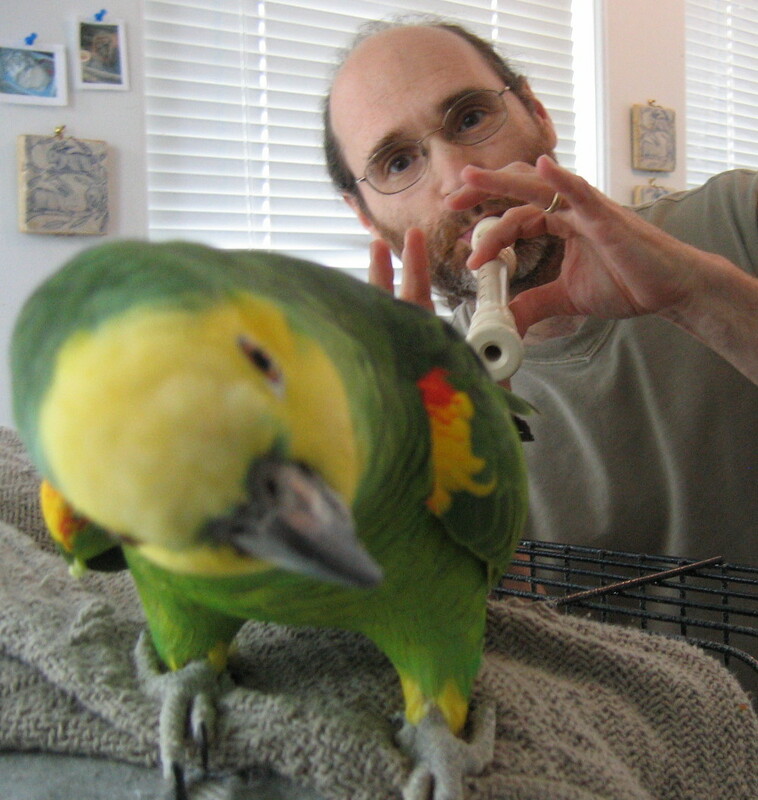 Certain kinds of playing help strengthen certain parts of our embouchure and breathing systems. Correct loud playing can build the embouchure and support systems of breathing. Be mindful of the dose and I recommend 3-5 minutes of playing loudly then take 3-5 break and repeat if it feels right. Short fast or slow tonguing, loud and soft, can also create greater cohesion in the embouchure which will be excellent for efficiency of response. High range playing will also help the feeling of 'grip' and add core to the sound. IF DONE BY THE METHOD OF PLAY REST, PLAY REST. If not, it can be damaging especially when it gets loud. Be patient, and find what works for you. PATIENCE IS ITS OWN SPECIAL KIND OF ENDURANCE, STRENGTH, ENERGY AND FOCUS. Try it and see!! Here is a series of 4 videos getting into the spirit and musical approach of endurance. These videos get into the basic principles of foundational attitudes to promote and sustain endurance as part of our music making process. There will be some accompanying postings giving more insight and additional exercises to try and apply if you so choose. The intention with the additional postings is to help by giving some 'concrete' practical integration material to make greater penetration into the videos. Don't expect from any of the FBSMC videos or writings, to get it all in one listening or reading. It is an organic process to explore and discover what it is for you. It is NOT a list of steps that just magically works by itself. It needs YOUR LIFE involved to open the door. In the next day or two, Session 4 of Frequency Bone Summer Music Connection 4, A Musical Approach to the Basics will be posted. It will be about endurance. One might ask, "What would be a musical approach to endurance?" That is a good question because the usual association with endurance is very physical or athletic. But I have seen 'musical' athletes and I'm not talking about whistling or singing in the shower. The way they play the game has a fluidity to it, a great sense of rhythm and poise. So yes, there can be a musical approach to endurance. Endurance is one of the basics after someone has been playing awhile. It does take strength to get get through the etudes and a band concert. No matter what level we are talking about, stamina is something that needs to eventually be developed especially if the player has career aspirations or wants playing to be a regular part of his or her life. Endurance might not be totally what you think either. For the physical aspect is only part of it! Here is a contemplation for you: endures = sure end. P.S. I hope you also are enjoying and gleaning the wisdom of Dr. Carol Viera from the FBSMC4 Extra! INTERVIEW. Watch for some more extras in the near future! These next 2 videos are the continuation of my interview with Dr. Carol Viera. I really was thrilled to do these videos with her which were totally unrehearsed and in the living moment! I've wanted to do an interview with my wife and partner, Dr. Carol Viera, for a long time. So today we sat down and did some spontaneous videos! This is an interview in which we begin to talk about basics of auditioning which might not be what you think. Here is the first video. Maybe more to come. We'll see! Warming- up is basic to brass playing. Not only to brass playing, but to anyone who uses their body as a vehicle for achievement. Athletes, martial arts people, dancers, musicians and actors and actresses to name a few. And don't forget those of us who exercise to keep our bodies healthy so it can continue to function well for as long as it can. Sometime in the next 12 to 18 hours, 3 new videos will be posted on warming up. This is what our Session 3 will be about. Remember this is a musical and organic approach that hopefully will inspire warming-up as something meaningful and practically useful. Warming-up is allowing ourselves the space to tune ourselves to ourselves and put all of our various parts in harmony with one another. It is a whole thing. Body, mind and our Self or Essence. It does not have to be some boring task or 'necessary evil' so we can really just do what we want to do. It is a part of the whole connective integrated process. 'See' you soon on a, musical approach to warming-up! Session 2 of Frequency Bone Summer Music Connection 4: "Articulation Not Attacks!" Here we are in "A Musical Approach to the Basics" Session 2, titled: "Articulation Not Attacks!" The description of these videos was posted earlier today, so please refer to those in the last blog post. Hope you find these useful! FBSMC4, Some Insights into Session 2, "Articulations Not Attacks!" Either later today or tomorrow, FBSMC4, Session 2 titled "Articulation Not Attacks!" will be coming to the blog. It is in 3 parts and of course consists of 3 videos. In Part 1, I was working with my new microphone trying to get a better setting so the sound of the trombone would not be distorted. So many things just started to flow out of me that I just kept this video which was really meant to be a test for microphone placement! When it is happening, let it happen! So from this 'test', lots of stuff flew out of me including the subject of articulation. So I took that cue and kept running with it. Part 2 could have the subtitle, "Find the Breathing Room within the Standard." What I mean by this, is to keep our minds and bodies from getting stiff while we get more specific about what we are looking for. There is aways room in what appears to very little room for 'error.' Even in the touchy realm of intonation! :-) Legato is brought up in this video and one of the important things is the attention to the musical approach. Musical here meaning, an idea that has gesture, contour and clear feeling or imagery. Part 3 could have the subtitle, "Basics are All Around Us" or, "Change is Basic to Living." Again, this video is very spontaneous and live at the point! There is a lot of fun and important information for teachers and students in this presentation. *As you can see from these videos already, I am being myself. I am giving myself lots of room while keeping on task. This is what works for me. If you watch all the videos, I'm sure that a lot of your questions that arise from my seemingly jumping around in the subject matter and weaving many things in, will be answered. If you have questions, please send them in the comment section and I will address them. In this pair of videos called "Basics are Natural," I am setting the tone for our summer get together which is called "A Musical Approach to the Basics." I approach the basics in a musical way and am very spontaneous with them. What is musical you might ask? Well, for me, it means to be genuinely alive! It is organic and very naturally basic. Finding one's way is natural in the discovery process. The good teacher is a skilled guide and the student is driven by their own inner force while listening and applying the guide's directions as good as they can. Note: I am experimenting with a new microphone and the sound is not stellar on these videos. Hopefully the next video which should be out in a couple of days will be better! Don't let the not terrific sound block you from getting the main feeling and points that are being offered. Welcome to the Fourth Annual "Frequency Bone Summer Music Connection"! Enjoy and take your time with this introductory video. A set of two more videos will be posted two days from now. Dive in and get your feet wet with the basics! This introductory video to this summer's work, "A Musical Approach to the Basics," is to encourage a fuller feeling for and connection to what is basic. The simple, core, elementary and fundamental aspects of any subject are its roots. The seed will become a fully mature plant if its basics are taken care of. It is home base, the grounded state where all the later developments find their center. 1. Take a breath through your mouth lasting 5 seconds. 2. Hold for 5 seconds. 3. Exhale the breath through your mouth for 10 seconds. 4. Repeat this 5 times then breath normally. How do you feel after this? 1. While taking taking the in breath, feel the air as a natural powerful source of fuel for your body. 2. While holding the breath, feel the air energizing your body. 3. During the exhale of the breath, feel all of your mind and body relaxed and stress free. 4. With each repetition of the 3 steps, feel each of the feelings get stronger and more potent each time. The importance of this simple exercise is to emphasize how important our minds are when we approach the basics. If we can have a feeling and connection about the basics that is natural and healthy, we will program our minds and bodies to get the most nourishment from them. BASICS ARE NOT JUST BEGINNING DO'S AND DON'TS. THEY ARE A VITAL PART OF DEVELOPMENT THAT HAVE A MENTAL, EMOTIONAL AND PHYSICAL CONNECTION. THEY ARE AT THE CORE OF IT ALL. THE SOUL PART. WHERE THE BASICS ARE IS WHERE THE ESSENCE LIVES. Yes, it is that time of year again! Very soon there will be the first video in my online summer camp Frequency Bone Summer Music Connection 4. It will consist of a series of great music, trombone and human interest topics. Frequency Bone Summer Music Connection 4, (FBSM4), promises to be captivating in all ways to a variety of musicians, poets, photographers and artists ... including trombonists! :-) My hope is to continue to shed light on bringing out the spirit of the music in each person. This summer will focus on how to be more creative with developing our technique, coming at it from a musical perspective. What is a 'musical' perspective? It is in the manner of approach. How we approach something can make the difference between a vibrant discovery practice session or a make the 'doughnuts' unconscious practice session. In my view of a musical approach, all of the basics are seen as expressive, meaningful and practical movements and gestures. These 'movements' and 'gestures' are ignited with the 'spirit' of what is needed. It is the type of energy that is put into the movements and gestures that make them 'musical.' It is in the 'Art' of the simple basics. These are seeds that can then be expanded upon so there is a natural integration of technique and the spirit of the music from the very start. I love the words from the song "Whistle While You Work" from the story "Snow White and Seven Dwarfs." Those words are profound really. For isn't it very felt and obvious when someone loves their work? But, it is clear not all practice sessions are full of a happy whistling attitude. Especially the ones where the urge to throw the horn out the window gets really intense! However, it is an excellent overall attitude to have joy in the simplest parts of playing. I love warming -up and practicing the basics. I find it very grounding and a time to get in touch with the foundational aspects without being preoccupied about how great it sounds. At the same time, these sessions are very important in keeping our playing standards up held in a simple and progressive accruement. Keep in touch with the blog and I hope to see you very soon for FBSMC4 entitled, "A Musical Approach To The Basics." In order to keep on developing in a given area that one has pursued for many years, I found that embracing change is profoundly important. To resist it can be futile in certain cases. Take our bodies, they change. If our identity is totally wrapped up in what we physically can do, that can be very traumatic when it changes, especially if we were getting lots of recognition for it. When this change starts to happen, or when we actually take a note of it and can't ignore it any longer, that is the time to embrace it. Not as a sign of defeat, or the "I think I'm loosing it" attitude, but as a chance for new insights and possibilities. The 'bump' in the road is not always a bad thing. It is all part of the journey. Let's take this into the brass playing realms. At age 57, my approach, physically, mentally and emotionally are quite different to when I was 19. The body is different, as well as my mind and emotions. Therefore, if I try to approach certain aspects of my playing now as if I were 19, the results would not be where I would like them to be. In fact, it could be damaging, certainly on the physical level. For example, when I was young, (which is not the same as youthful), I never thought of using different vowel sounds for certain registers of playing. There was no need at the time. I made the adjustments in another way in a certain method I developed. When this system broke down, I was put in a position to discover another way. Having been playing in this 'other' way for well over 30 years now, there have always been changes on a smaller scale that needed to be addressed and vowel sounds evolved. So did many other types of articulation. So did many types of airstreams and vibratos. This is all on the technical level. The musical level got richer and instead of just coming from my first response feelings, I built deeper relationships with the music as a living life. Music was just the form but it was a living, breathing being with multi-dimensional expressions and essences. To someone who has not been on this journey it might sound complex. Put it is not to me. It is a living relationship that has it's fluctuations and patterns new and old. Just like person and other living things do. Embrace change. It is part of life and music. In that embrace, what can magically appear is that special something, that actually does not change but appears in many forms. In this, we can always be young! This is a very intriguing topic for me. Because like everything else, interpretation has levels of insight, perception and process. And these depend on the depth and power of the connection of the interpreter. Are there wrong interpretations of books, poems, music and everyday conversations with others? Most would say yes. But I would say, as another way of looking at it, it is a matter of the consciousness and angle of incidence of the interpreter into the subject matter that would determine how close to the truth the actual interpretation is. Having said that, that does mean that certain interpretations can be very far away from where the actual point or core of the truth is? In fact, it could be so far away, that it is totally disconnected to what the piece of music, poetry, movie, or anything else is about, that it creates it's own separate little reality. How about when someone says, "that is a very dry interpretation." Someone else might 'warm' to that 'dry' version of that piece of music. Others might feel it lacks emotional content. There might be a group of people that would say it was 'appropriate' in the context of the music. Here is a big question, IS IT ALL IN THE EYES OF THE BEHOLDER? And this begs the question and further enquiry into what is IN the beholder? There are people who are considered great experts or authorities in a particular field. A Bach expert or an authority on the music of Mahler. Is knowing something about a piece of music or a work of art important before playing it or listening to it? What happens to you before you know about a piece and you play it or hear it? How does, if it does, change or alter your feeling and interpretation of the piece after you know something about it? I have found that knowing something about a piece then playing it, can make a profound difference in the way I approach it. Here are some crucial things to consider: When you interpret, WHAT is interpreting? Your academic references? Your emotions? Your 'practical' mind or your 'abstract' mind? Your former or current teachers' concepts? Your instincts? Is there bias? Your likes and dislikes? This is a big subject and is not complicated for the sake of complication. IT IS WHAT IT IS. In my looking at this, I see an amazing opportunity for deeper personal growth. It is best to be simple with it perhaps in a childlike way. How does it make you feel? How does your body feel when you hear the piece? Does it bring up thoughts of a certain kind? Do you feel energized or drained of energy? There is a good one to look at! Musicians often say they want to be true to the composers wishes. Do they know what those REALLY are? That is the quest. And this is where letting yourself be free for a while to go on some journeys, some mystery dreaming and let your thoughts soar. This will thicken your interpretation. It will make it richer and more vivid because you will be playing with more connections. The actual written music, depending on what you connect to when you are playing it or thinking about it, is a URL to the site in the life of the composer and to the Universal Web of what he or she was ACTUALLY CONNECTED TO, WHETHER THEY KNEW IT OR NOT. This is of course, one of those things that I would say is science fiction until you can prove it to yourself as fact. I have NO DOUBT about it's reality through my own experience and process of many, many years. In the very end, maybe it is the process and journey of what happens to us that is more important and vital to our lives than what would seem to be a 'correct' interpretation. It's in the process that we evolve. Most people will not win an orchestra job that can totally support them financially. Some people keep trying regardless of how many years they have been attempting it. A great mentor of mine said; "it's not what you do, it's the reason why you do it". So a person might have strong personal reasons why they need to keep on trying for 'the job'. An orchestra job is a particular type of job that is governed by the fashion of playing currently in vogue. People are very easily impressed by 'perfect' rhythm, pitch and accuracy. Put a 'beautiful' tone on top of that sprinkled with the 'appropriate' amount of the condiments of dynamics and style, and you will stand out as a gem. An excellent key on the orchestral keyboard. Not an easy task to accomplish! It takes a TON of hard work, determination and talent to achieve that kind of standard. Here is the big BUT; not everyone can take their playing and push it into that narrow space of expression and tone. This is more of the case with brass and woodwind players. It seems that strings are 'allowed' to have a big spectrum in general including in the orchestra while winds and especially brass, need to be more conservative. Is this the 'correct' role and function of each section? Maybe….BUT! Perhaps those of us who cannot just have our whole soul based in that realm will eventually break free of that prison and form new groups and orchestras. Certainly a lot of the music written now calls for a very extreme dynamic and expression range. At the same time, the criteria for getting into an orchestra now and playing mostly the 'classics', calls for even tighter control over the emotions and technique. ( I don't think this was the original intention of the composers and has worsened due to the digital era of virtual reality). A very interesting comparison. Perhaps the 'new' music of today is getting very tired of that narrow box and the orchestral- classical- box is getting frightened and is clinging more than ever to its proper, clean and good mannered playing. It is clinging for it's dear life so much so that it is choking itself to death. We will see what evolves in this unfolding drama of music in the future. The future is actually here now. This post was inspired by a couple of things. One strong influence was seeing my son Ben's new music group called "Holographic" last week in Bloomington Indiana. Ben is co-founder of the group and conducted several of the pieces. The compositions were outstanding, the musicians were terrific and Ben's conducting was superb. What was truly catching about the evening, was that I had never heard these pieces before. I was 'free' to hear them without prior comparisons or preconceived ideas of 'how' it should go. It was very invigorating. Maybe the 'classics' need a fresh approach that is connected to the SPIRIT of the music instead of a very overly studied and stifled rendition. I think 'classical' musicians need to loosen up a bit frankly. THERE IS ALWAYS ROOM IN EVERYTHING TO HAVE A FRESH AND ALIVE CONNECTION. It is interesting to see how soon someone gets satisfied with their playing. Some people are never satisfied totally. Some get satisfied with their standard quickly. I find this is directly related to the power of the desire to improve and the willingness to work for it. *How much are you willing to search, try, experiment with locating and tuning into the expression and meaning of the music? If you feel that it gives up, what is giving up? *Is it easier for you to hear technical flaws in pitch, rhythm, tone or clarity? *Do you feel a sense of satisfaction at the end of a practice session regularly? *Where and when do you feel the most satisfied? How and what made you feel satisfied? *What artists or concerts make you feel satisfied? * Is it important to feel satisfied all the time? * What do you do when you are not satisfied in a practice session? 1. How do you handle it? 2.Can you spot why you are not satisfied? Depending on the natural inclination and passion of the student, keeping what's naturally expressive is important in the midst of working on improving technique. A habit can seem 'natural' when in reality it is a reflex or a reaction to a set of certain physical-psychological balances. Then during the repetition of the action, can turn into a 'hardened' habit which sometimes people call their 'second' nature. A fall back situation, (habitual- comfort- zone) are often seen and felt as 'second' nature. A natural inclination towards needing and/or wanting to express oneself, (on an instrument and in other areas of life probably as well), most often will not get lost while working on refining and developing more technical control. BUT, if the student has a teacher that has an extremely tight and narrow idea of how an instrument or piece 'should' be played, it can interfere with the natural talent and become very destructive to the student who needs to express themselves personally in their music making. This is why, in my view, working on technique needs to have at least the prime element of music involved which is movement. Not just metronomic mono rhythm, but fluid directional movement. Then the expressive player can channel the energy into that movement and find it's musical substance even if the 'spirit' of the exercise is on the drier side. It can still have grace, momentum, vibrancy and other qualities. That is why I often think of being an actor that has many modes of behavior when I play. When doing that, my playing always is energized whether it is an Arban's study, a dry staccato Stravinsky note, an excerpt or a prayer. It's all in the connection. To change or even slightly alter deep ingrained habits, takes real determination and constant vigilance. It is a whole process and can be expedited by having a notebook of what you want to change written down in it and then remembering to look at it before each practice session. This will help. The important thing to realize is that what we do automatically has become unconscious or semi-conscious. With each action there is a certain speed that is going on. If we alter our speeds, usually be slowing down and deliberately thinking about what we are doing and what we want to accomplish, can help assist in retraining our systems towards our desired goal. This takes time and should not be rushed. If it is approached daily, with thoughtfulness and care, it will change quicker than trying to force it at a faster speed than it wants to go. Being consistent and regular with our efforts is the key. A great mentor of mine used to say, "Go slow to go fast." It is true. If we do not, we will eventually have to spend time undoing the new not so great habits we developed trying to improve the old ones we were trying to change. A habit has attached to it a physical, a mental, and many times an emotional component. That is why taking our time in changing old ways is so important. There is never just one thing. One thing is always attached to other things. With attentive practice, one will start to see much. It is well worth the investment of time accompanied by a supportive attitude to change habits that block our desired goal. When someone is 'out of control,' what are the characteristics emotionally, mentally, verbally, physically? If someone is drunk or impaired in some way behind the wheel of a car, that person presents a danger and a hazard to others being on the road driving. They weave in and out of their lane, speed up or slow down at odd and strange times, don't obey the traffic signals and on and on. So if someone is out of control in their playing, what does that mean? Are they a danger or a threat to other musicians in the ensemble? Do they not 'obey' the musically notations and do random things and act in their own timings regardless of what it says on the page? Do they not have the ability to hold notes steady and place their articulations evenly? Are they limited in their dynamic contrasts? If these are signs of being out of control, what are the causes? Perhaps a very important question to ask is "What is controlling the person?" There is an interesting relationship between concentrate, center and control. If someone is not in a stable place in themselves, or they can't find their 'center,' control can be challenging. If a person is unable to concentrate, (act on center), then loosing ones place in the music and other things can start to go awry. Control is being able to do what we need to do, in the way we want to do it, when we want to do it (or have to do it in the way someone else wants us to do it). Control is having the ability to do something effectively. Control has a spectrum of skill or lack there of. Control is a harmonious relationship between our mind and body where they both work in synchrony with each other. (Coordination is an important ingredient in having control). Control is being able to stop or go when we want or need to. Control is in the transitions. Control is not a small little tight box with hardly any room to breathe. Control is not limited to certain dynamic contrasts or tone colors. Control is having flexibility to change and move beyond our comfort zones when needed. Control is conscious will in our actions that can be used in the attainment of our pursuits. Having control is being be able to function with quality and to perform actions in accordance to what is called for in any given situation. Study the relationship between skill and control. Can you have skill without control? Don't think so! Think of many situations that call for control. To control our temper. To control our eating and drinking. To be in control of a situation. To NOT control our friends or colleagues. If having control becomes a prison, then where does freedom come into it? Having freedom to be able to do, is this control? If control becomes a musical concept and school of playing, is it attuned to the essence of the music? The finest control is to be open to the essence of the music beyond our biases and then have the assembly, musically and technically, to deliver it. This is where training physically, mentally and emotionally are important. All three are important because just having physical expertise will not bring the music to life. A person typing someone else's poetry does not make them a poet.